The Urban Outfitter Kent State shirt design. It’s almost embarrassing to talk about it. On the one hand, what power could a shirt design have? Shirt designs come and go in seasons, like everything fashionable. New ones pour out of department stores daily. What could have caused one shirt design to get so much flak? Last week, Urban Outfitters released a shirt that became almost immediately controversial, not in a good way. 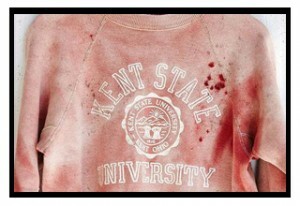 The shirt has the Kent State University logo on it, under what seems to be a lot of blood staining. Responding rapidly to criticism of the design, Urban Outfitters went on record saying what looked like blood stains were really just a “vintage” look but then proceeded to take the shirt down from their website, not wanting to further offend. No one so far has taken the “credit” for designing this shirt, but of course, no matter how this happened, the final responsibility fell on the company for offering it in the first place, and once it became clear to them it was “unfortunate”, they handled it well. They don’t seem to be uncomfortable with controversy. Four unarmed kids were shot by the National Guard at Kent State University in Ohio in 1970, during a protest related to the Vietnam war. I was a freshman in high school then, but at 15, my friends and I were aware four kids around our own age were killed for disagreeing with the government. It was reported that the National Guard fired 67 rounds over 13 seconds. Some time after this, I participated with other kids from my high school in our own demonstration, complete with homemade posters calling for the safety of free speech. We were pretty young, but we knew it wasn’t okay to shoot someone for speaking their mind and certainly not a kid in school. At the time, I didn’t completely understand the imbalance that government was heading towards, towards the extreme imbalance we are experiencing today where our freedom of press and freedom of speech are entirely compromised. And at the time, I didn’t imagine the role that powerful, meaningful graphics in popular culture could play in influencing a population – except that my participation that day in school was prompted by well-designed and well-written articles, graphics, and even a song that spread like wildfire across the US. Ultimately, graphic design and the young, fashionable, hip media of the day, made what happened at Kent State relevant to kids like me. No matter what was behind the making of the Kent State shirt, there had to be a few hoped-for responses from the potential consumer: Do you wear the shirt with pride because people died that day and you want to remember them? Seems unlikely given an audience of buyers who may have no clue about what really happened at the Kent State killings. Do you wear it because it looks like something dangerous happened there and you want to appear “dangerous” too? Possibly. Or maybe “social relevance” is just the latest sales tool* Gasp. So terribly un-PC: “This is such a cool shirt, and didn’t something bad happen at Kent State once?…that would be a great selling point etc etc“… Perhaps they thought it would be part of a “Protest Wear” line; cashing in on the ever growing discontent of people around the country complaining about censorship and control. Except that innocent people died at Kent State at the hands of the National Guard, they might have imagined it would represent a sweet memory in our collective consciousness: a time when youth stood up for something they believed in. It’s not that a corporate entity got “caught” while it slept through history, or created something that embarrassed them and had to take it off the market that matters to me. That kind of thing happens more regularly than anyone would want to admit. The reality that it could happen at all – even looking at all possible, plausible, excusable reasons squarely in the eye – is a sure sign we have become pretty irresponsible with our message-making. In 1989, too long ago for many young designers to remember, an AIGA conference took place called “Dangerous Ideas” where Tibor Kalman and Stuart Ewen** asked if graphic design had simply become a tool of corporatism. Tibor annoyed a lot of wealthy, celebrity designers in the audience as he accused them of having no conscience while doing highly visible, professionally celebrated and well paid work for ultimately abusive companies, and his presentation was unforgettable. It caused quite a buzz around the coffee breaks and prompted a public debate later that day between Kalman and Joe Duffy, becoming quite the spectacle in an impromptu battle of wits. I appreciated the exchange, but it all seemed hypocritical to me. If design was portrayed as a ladder to fame, fortune or status, the designer needed to play by the rules, even if he/she was able to bend them a little, like Kalman did. By 1989, we all knew that design was compromised as a tool for social reform, and there was little anyone could do to change that, if designers wanted to keep the cash coming. It’s a bargain designers make with the devil: use your talents and mind for the corporate ideal and keep your opinions and ideas to yourself. Urban Outfitters has safely, and smartly ended the discourse over this shirt. On to the next concept. But the shirt did not go entirely unnoticed by the public, which is a really good sign. Many believed it trivialized police brutality, not to mention death, protest and free speech. Some folks know what happens from experience, when peaceful protest is met by the “authorities” and we still don’t want to be killed, imprisoned or blacklisted for disagreeing with our government. Perhaps this is even more meaningful today than ever, in the wake of a militarized police force and the ever-growing power of the NSA. If we believe that graphic design has nothing to do with how we view or remember experience, this is our wake up call. Graphic design remains a powerful tool of our corporate culture, often used against us, rarely used for real education or enlightenment. If we as designers have relinquished our potential influence in order to climb the corporate ladder or feel good about being “artists”, it’s completely understandable, but does this also give us permission to be irresponsible with the messages we share? * An entire discussion for another blog! ** If you don’t know who these guys are, just look ’em up.